Pension reforms have increased the prospect of people being conned out of their life savings, a committee of MPs has concluded. New rules, which came into force in April, allow people aged 55 and over to cash in their pension pots rather than take a retirement income. This new system "is not yet operating entirely as it should", the Commons Work and Pensions Committee said. The government said any exploitation of retirees was unacceptable. MPs on the committee also raised concerns about gaps in advice and charges. And they said that there were dangers of a mis-selling scandal if pensioners were unable to make informed choices. Some 204,000 people accessed pension pots in April, May and June. This was more than double the number in the same period in 2013, partly reflecting customers delaying accessing their pots until the reforms had taken place, the committee heard. Annuity sales dropped to 12,000 for the same three months, compared with 90,000 in the same quarter of 2013. Some 121,000 customers had opted for cash withdrawal and 71,000 had accessed some form of product to draw income from a pension fund that remained invested. Making these financial decisions left many people at risk of being exploited by con-artists, the committee said. "Financial scammers are notoriously adept at reinventing themselves to take advantage of such opportunities. 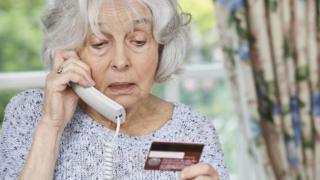 But this does not mean scams should be accepted as a fact of life," the committee said. In response, the government said it was working hard to tackle the issue. "The Government has been absolutely clear that any attempt to exploit people who have worked hard and saved for their retirement is unacceptable, which is why we are working with police, regulators and other bodies to raise awareness and take action to protect consumers," said a spokesperson for HM Treasury. Another danger was the lack of suitable advice for many people approaching retirement, especially those of middle-incomes. Frank Field, who chairs the committee, said: "We have seen all too clearly, too many times, what happens when financial information is not properly provided and regulated. We literally cannot afford another financial mis-selling scandal." There was also criticism of Pension Wise, the government-backed free service which guides people through the new rules. "The website is not fit for purpose. It is static, offering no opportunities for personalisation, and lags well behind many private services," the report said. A government and City watchdog review into financial advice should consider whether retirees facing jargon and complex financial choices should be given two or more Pension Wise guidance sessions rather than just one. However the government said Pension Wise had been a "real success story", with over 20,000 guidance appointments since it started. Pension Wise offers web and phone-based services, as well as face-to-face appointments through Citizens Advice. The City watchdog, the Financial Conduct Authority, told the committee that, in July, Citizens Advice was running at 10% to 15% of its capacity to provide face-to-face appointments. A pensions dashboard - allowing people to view all their pension savings and entitlement in one place - was "long overdue"
"Freedom to choose is not enough, people must have freedom to make informed choices," the report said.